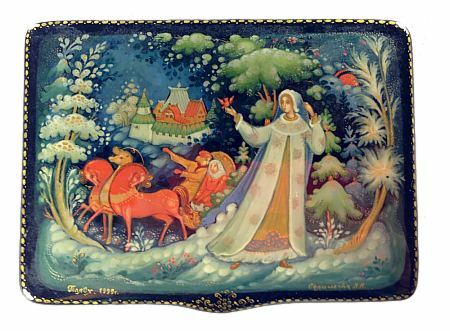 The Snow Maiden feels right at home in the winter forest, playing with birds and enjoying the cold breeze. Her old parents are passing nearby in a carriage, marveling at the child. The bright red and yellow garments of the old couple contrast the light blue and white attire of their daughter, perhaps symbolizing the earthliness and life of the parents and the transient nature of the Snow Maiden, who belongs to the winter. The box is made from high quality papier mache. It stands of four small legs and has a hinge at the top. The interior is red. 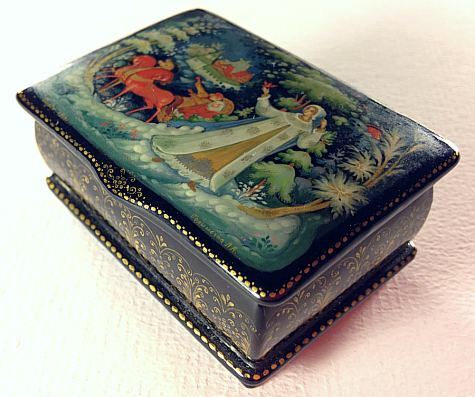 The sides of the box are decorated with an elaborate gold and silver ornament. Signed with the name of the artist, village, and year.